This entry was posted on Wednesday, March 23rd, 2011 at 10:38 pm	and is filed under Blogging, Christian Living, Church and Society, Evangelism, Politics, Theology, Women. You can follow any responses to this entry through the RSS 2.0 feed. Both comments and pings are currently closed. This is all fine and dandy, but there are times that faith is irrational. It makes no human sense, and logical approaches to it kill the ability to act on it. It is the continual application of this chart that has stripped faith in Christ down to faith in rational human beings. They are not always the same. This chart, when applied to a current situation of mine, is actually destructive. Where is the evidence, for example, that Jesus Christ really rose from the dead? Beyond “the Bible says so”, we don’t have any. This chart is not useful. Hi Julie! Nice to hear from you again. I think I get what you’re saying, although I think I’d say that faith demands us to reach beyond reason and rationality, not necessarily to abandon it. There are certain logical frameworks that simply exist. Even God can’t make a square circle, for example. That’s not limiting His ability at all, it’s just those two things are just categorically different. I’d also say regarding the resurrection, while we won’t ever find proof enough for some, I’d say the gospels themselves are very careful to point out the resurrection was an actual historic event. They give names of people and places, and witnesses who were there. I guess that’s the one big thing that set Christianity apart from the gnostic mystery religions of the time. The apostles were very insistent that Jesus was a real human who died a real death and rose again in a real physical body. Is this open for discussion? an application in which this chart is helpful, is (if it were actually followed) would be keeping discussions going into a deeper level. over and over again someone will comment – most often a judgment against a brother in christ. and when their comment is shown to be faulty they just move on to other accusations. nothing is learned. that dais, i think the first contingency is faulty. i think i can discuss something even if i can not think of anything that would change my mind. 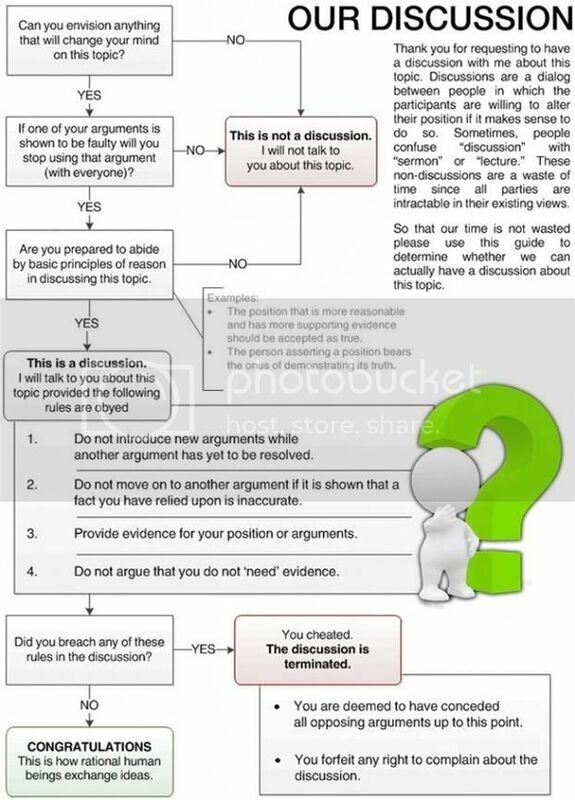 in some cases that is the whole point of having a discussion.